Fastback®— revolutionary tabletop binding machines that produce strong, beautiful tape binding, and bookstore-quality perfect binding and hardcovers. The Fastback® line ranges from small office machines to systems that can support a high-volume digital press. 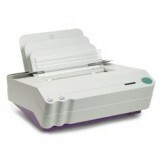 The most versatile desktop binding machine in the world! Foilfast Printer prints in six dazzling colors of foil in less than two minutes, and at a fraction of the cost of traditional foil-stamping techniques. Create hardcover books on-demand with this easy to use guide.